Who knew that Dr. Seuss could give us guidance on how to be an excellent trial lawyer? Wisdom, though, is anywhere you choose to find it and Theodor Geisel was wise to the interactions among people in ways that too many of us overlook in both our personal and professional lives. I have found in my many readings of Dr. Seuss (courtesy of three children!) that there are snippets that can guide a strong and successful practice as a trial lawyer, with a little perspective thrown in. Away we go! There was several years ago an ad campaign for the insurer St. Paul/Travelers that said - “To err is human. To get sued for it is pretty much a given.” This is the beauty of being a trial lawyer, there is so much out there. While practices have become increasingly specialized across time, for the new and learning trial lawyer, there is no better experience than to find a way to branch out your practice. The best way to take, or prepare for, a great deposition and trial testimony of a bank president is to also be able to take or prepare a great deposition of a truck driver with an 8th grade education. If you need to do so, find that new area in pro bono efforts. Those will give you more opportunities in court and hearings. Also take every opportunity to be a counselor to your clients. Tell them how you, as an outsider, see that the event or dispute developed and how they might mitigate future litigation. Make it one of your missions to be this “value added” to the client. Today is gone. Today was fun. Tomorrow is another one. Everyday from here to there, funny things are everywhere. Start every case by remembering that it is one case and that it isn’t “yours.” Trial lawyers stumble when they get too personally invested, whether by failing to see and act objectively or by injecting personality in harmful ways. Stop yourself every time you say “we” or “I” or “our case” in discussing the matter. Remember and repeat often that you cannot change the facts. DON’T EVEN TRY. Spinning those facts to the best advantage within the context and the law is a trial lawyer’s stock in trade, but it is a very thin line. Taking even the smallest liberties with the facts can be fatal to your case and to your credibility. Revisit frequently what you think you know and what habits you have developed about evidence. When you are preparing for trial, look again at every piece of evidence you want to get in and every piece of evidence the plaintiff wants to get in. Review every word of them before trial. It is nearly certain that you will have overlooked something in one of your documents that, now that trial has approached, is more dangerous, ambiguous, or simply irrelevant than it seemed six months ago. By the same respect, there is undoubtedly something in the plaintiff’s proposed exhibits that you will now find immensely helpful. On every case, make a part of your trial preparation to get another viewpoint. Though there is exceptional value in knowing every square inch of your case, every nuance and personality involved, there is just as much value in getting an outsider’s view, because you will become jaded and blind to both strengths and weaknesses in your case. Take something of value from every trial — and then share it with your colleagues. Listen with interest to everyone else’s war stories during the breaks. You haven’t seen it all and you will learn something, guaranteed. It may be about your judge, another judge, a lawyer, a technique, but it will be there. Also, start from the beginning making a list of every case you try, no matter how small. This becomes not only a fantastic resource for your progress as a trial lawyer, but a valuable tool in convincing prospective clients and superiors that you have the experience to serve them well. Being a trial lawyer is not a career ladder, it’s a jungle gym. There will be slumps, indecision, stress, and, of course, defeat. Trials come and trials go; it is okay to lose sleep over them — both before and after, but learn to not rest on your wins or your losses. Rather, schedule into your practice some rejuvenators that put spark into your files and your efforts. Start with The Great File Cabinet Fumigation. Trial lawyers are well familiar with high/low agreements and other such creative resolutions to cases, but they don’t happen often enough. Go through your entire inventory of cases, particularly those in which you believe that you really have the upper hand, and make a decision about whether some sort of creative approach might be a means towards reaching a more streamlined and efficient resolution, satisfactory to all parties. Learn to delegate, delegate, delegate. As we all learned in kindergarten, sharing is a virtue. If there is some part of a case that has you stuck in “ignoring mode” or mired in uncertainty about how to manage it, pass that on to a colleague who can move it forward. A few times per month, give yourself the gift of the magic Off Button. Turn off your phone, your computer; close your door. Let a thought enter your brain and stay there for a little while. Puzzle though a case, an opening statement, a contention with an adversary, anything that needs some committed time. Find a way to be a mentor to the one down the line. There aren’t enough cases being tried now to make good trial lawyers just happen. Take what you know and share it, because that will make you better, too, and will kick start your joy in trying cases again. Trials have a lot of moving parts. You really do have to know all of the evidence, all of the contents of the exhibits, all of the deposition testimony. In the courtroom you need to engage your several sets of eyes and ears to follow what is happening, anticipate the next event, and object when necessary. The division of your attention is overwhelming. All of that is why your preparation has to be complete and exacting. Start from the beginning — have a system. Mine is to have an old school outline of the trial, from preliminary matters, motions in limine, voir dire, opening, plaintiff witnesses, etc. Every single stage or element of the trial is on that outline and I check it off as I have completed its preparation. I then have a folder for every single stage, holding the transcripts, the anticipated exhibits, the notes, the research, whatever pertains to that issue. Some people use binders; some use a tablet or computer. Whatever system works for you is fine, as long as you have one. Take that preparation system and then adapt it for the actual trial. What do you need to know when you arrive and get underway? Every aspect of the courtroom — research the judge, know her courtroom rules; know the layout and technology of the room; have a plan for what kind of jurors you want. Make sure your plan for trial includes your theory of defense, know what objections are likely to occur and have them ready to go in detail, to preserve your record. Prepare your witnesses deeply and more than once. Give them an outline of the questions you plan to ask and rehearse with them. The best way to simplify a complex effort like a trial is to leave nothing to chance or uncertainly. Factor in a minimum of twelve hours of preparation time for each day you anticipate the trial to take. You will have disagreements in trial with your clients, your witnesses, the other attorneys, and the court. Be brave and stand up for what you know is the right way to proceed. Don’t get trapped into thinking “I have to appear before/represent/oppose this guy again, so I don’t want to get him mad at me.” Be willing to be yelled at if you are right. Develop the reputation that you know your case, know its value, and are confident in and will stand by your decisions. Don’t allow a judge or adversary to bully or shame you into not making objections or not fully stating the basis to support them. Do not presume the court will pick up on liberties taken or misrepresentations made by your adversary. If those affect your client and your case, you have a duty to raise them, politely and professionally. If you see it coming, head it off by raising the issue with the attorney first, so that you have taken every opportunity to keep the trial free of such distractions. Be proactive, not reactive. Look at me! Look at me! Look at me now! I can hold up the cup and the milk and the cake! I can hold up these books! And the fish on a rake! I can hold the toy ship and a little toy man! And look! With my tail I can hold a red fan! I can fan with the fan as I hop on the ball! But that is not all. Oh no. That is not all . . . That is what the cat said . . . Then he fell on his head! As mentioned above, a critical aspect of being an excellent trial lawyer is involving others. Of course, a top notch paralegal can be a life saver in the preparation and organization, but you don’t need to be the sole hero attorney. Find a way in the budget and the client relationship to add help. Learn when and how to delegate, by adding another attorney who can be assigned witnesses or motions. When you are entering trial mode, foster an atmosphere around you where your staff, colleagues, and family can take the initiative, freeing you up to focus on the trial. In your other commitments, personal and professional, decide up front and communicate that you cannot be all things to all people while you are in trial. Become comfortable with the fact that while you are in trial, the trial comes first, second probably is all of the rest of your clients who are yammering for your attention, notwithstanding your unavailability, and then third and maybe even fourth if you have some other professional obligation, comes your family. For the period of time that you are in trial, they will probably survive. Their father/grandparents/caregiver will most likely do a pretty good job of making sure that they are fed, bathed and get to school on time. If you try to give one hundred percent to both putting your family first and your trial needs, neither one of them is going to be getting the real attention necessary. Keep in mind — laundry will wait very patiently! The bemoaning of the demise of civility and professionalism in the trial bar surrounds us. Nowhere is the demand more important, though, than in the courtroom. There, it really is all about you with regard to how the trial will go. The best and effective trial lawyers are on the high road all the time; they are professional all the time. Once you enter the courtroom, you and the adversarial counsel must put aside past differences and establish a congenial relationship. Notwithstanding a perhaps contentious pre-trial relationship, with an adversarial counsel or party who may have been unprofessional and unpleasant, or may be pursuing an utterly meritless case, to the vast expense of your client, the advent of trial changes everything. There are witnesses to be scheduled, exhibits to be discussed, and minor ordinary trial disagreements to be worked out. 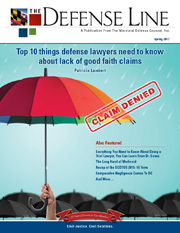 The fact is, since we have no control over the length of the plaintiff’s case, it is most often the defense counsel who needs to ask for the accommodation of the plaintiff’s attorney in putting on a defense witness out of turn, disrupting the plaintiff’s flow of evidence and sometimes damaging it by inserting an unhelpful witness smack in the middle of the plaintiff’s compelling presentation. There are going to have to be bargaining sessions over evidence. There is almost always something you want in that might not get in without the other side’s agreement. You have to be willing to not only broach the topic, but to be offering something in return and to present the deal in an appealing and accommodating way. You may also find that both sides of the case are victimized by the court, who might have no respect (and even some contempt) for the schedules of the parties and their witnesses. As mutual casualties of an unpredictable schedule or unappeasable judge, you will be forced to work together as closely and congenially as possible to get through the matter. Don’t let the creeping casualness of business life in general seep into your professionalism. Be on time. All the time. No matter what. Always give your client and your colleagues and the court the best — don’t permit typographical and citation errors. Don’t ever publicly blame your staff for errors — even when it is their fault — it is your work. Remember that a great jury makes a world of difference. Take credit for putting on a good case, for making the right decision to try it in the first place, and for being lucky in getting a defensible one. Never lose sight of the fact that juries have made shockingly wrong or bad decisions. Don’t take it personally when they do. Don’t steal all their credit when they get it right, as they usually do - whether you won or lost. Never be unprofessional, or disrespectful of the court, parties, or witnesses. Be scrupulously honest — your word and your name are your stock in trade. Be accountable. Be the person in the room whom the judge and jury trusts absolutely, even if they don’t necessarily agree with your position. Don’t gloat. When you have prevailed over a meritless case, an unprepared or careless lawyer, or an unpalatable party, you are a true professional, a true grownup, and a very good trial lawyer when you can immediately march right over, shake his hand, and wish him well. Don’t brand judges and don’t brand lawyers. Chances are there will be another day with both. Learn from those interactions, but don’t burn your bridges. Apologize immediately and ungrudgingly when you have crossed the line. There you have it. Dr. Seuss’s easy steps to trial lawyer greatness: 1) try new things; 2) be objective; 3) be creative; 4) work hard; 5) stay focused; 6) be good and do good. Ms. Ward is a graduate of Georgetown University Law Center and is admitted in Maryland and the District of Columbia. As a principal of Ward & Herzog, LLC, a women-owned litigation firm, Ms. Ward’s practice includes commercial litigation, professional liability, long term care, and insurance coverage and defense, employment, risk management, trademark, and commercial litigation.Ms. Ward has been an active leader of state and national professional organizations, including the Board of Directors of DRI and former President of Maryland Defense Counsel.